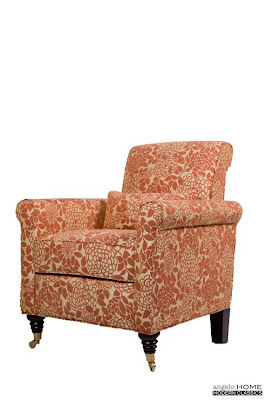 My HARLOW chair in a mango floral fabric available at OVERSTOCK starting AUG 10th. 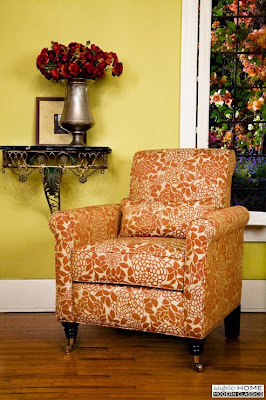 This is the perfect accent chair for a room filled with earth tones. It mixes well with solids, dark woods and can be the right fit for Fall or Spring decor. 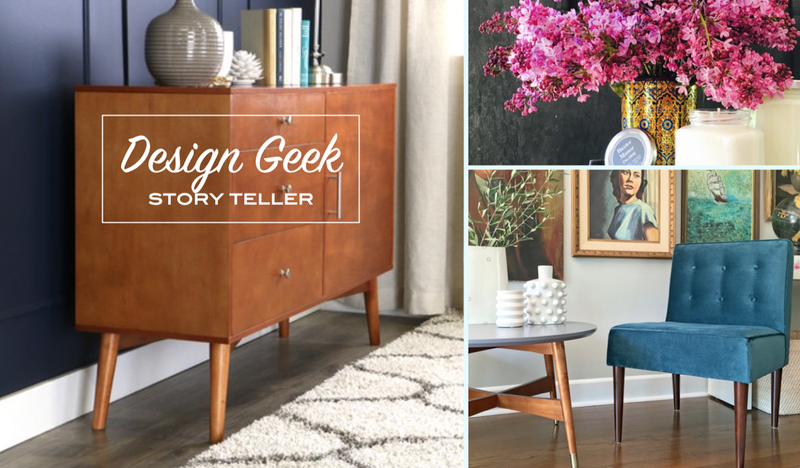 The classic shape mixed with an updated, graphic approach to floral strikes just the right balance for a living room or a seating area in a master bedroom. 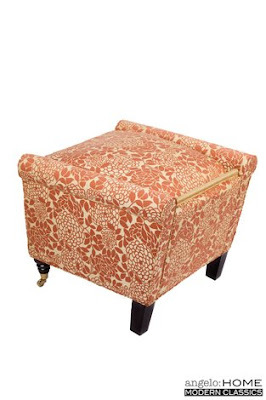 Also, since it's not oversized, it can even add a bit of color to a guest room. A great looking chair that's even better looking in person. IT IS! WOW. 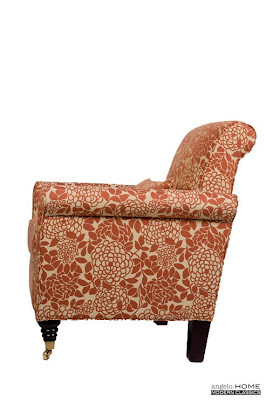 I love this combo of chair profile, leg detail and fabric color. Well done. I think I might have just solved my chair dilemma. AUGUST 10th where are you?! 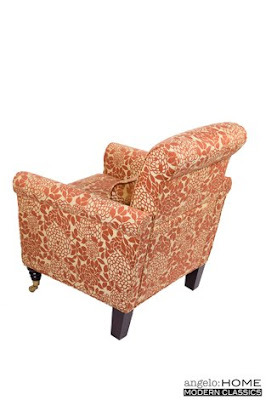 This pattern, chair shape and legs are making me weak. 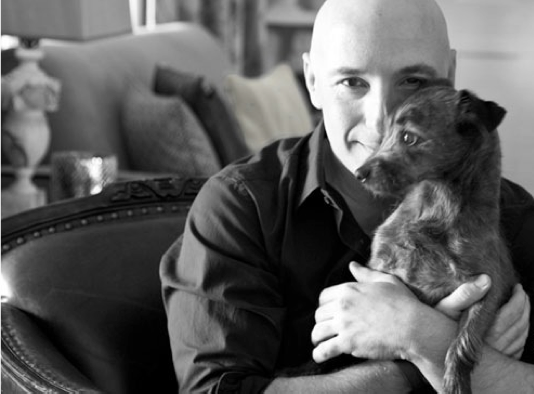 Angelo, you are constantly surprising me with your ever inspiring style. I can't wait to start furnishing my new place. I like the pattern on this chair better than the previous one. I'm just not a fan of the wheels. The brass just really jumps out at me and I feel like it ruins the stream line legs. This is a really great pattern. I am glad about the wheels. It's just enough of a throwback to traditional styling and I have seen too many streamlined espresso leg options in the world. 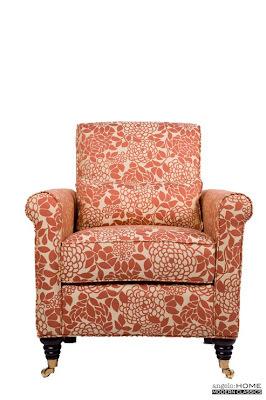 Is this chair available in greens or the b&w pattern you've shown? Can't wait to see all the styles. I have to stop looking, but I can't! You are driving me crazy with this stuff. Just gorgeous. Angelo, I love that you're using the little wheels on your chairs. I'm a fan of them too. I can't find any online to replace them when I find an old chair with damaged ones. I guess they'er very unique. They add something special you're line. I too am a fan of the wheels. They do add something truly special to a piece and give even the most contemporary of lines a little feeling of substance. Excellent mix in all your styles. Love your work. I have the perfect spot for this chair. It's perfect the way it is. Don't change a thing. I can definitely live with this chair. DEFINITELY. Bought it. Can't wait for it!